My Take on it – As I mentioned in my review of Gremlins (1984), I’m not much of a fan of horror movies, but these films are about as close as I’m willing to get. Whats extremely interesting about this film is that it in many ways parodies the first one and even goes to lengths to try and make fun of the Gremlin “rules” by having a group of characters discuss the absurdity of some of those said rules. Apparently, this scene was added due to the fact that many of the questions raised in the scene are real questions that the makers of the movie were asked after the original was such a hit. Suspension of disbelief is an integral part of enjoying many movies and the fact that a movie would blatantly make fun of it’s own “rules” shows how much they care about their audience and how much they are willing to even laugh at themselves. That being said, this movie’s plot is extremely weak and we don’t care much about any of the characters (even those who survived the first one). 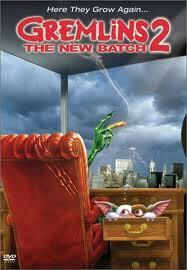 I’m truly glad they stopped after making this one because I think Gremlins 3, would have been waaaay too much. This movie came out in the summer of sequels and was obviously finds itself among the weakest ones from the summer of 90. Bottom Line – Not as good as the original Gremlins (1984). Does a great job of parodying itself, but there isn’t much of a story.